So Brooklyn Supper has never been completely strict about local food. We drink a lot of coffee and zest a lot of lemons, but this winter, we’re actually trying to eat a little more non-local fruit in order to eat more local vegetables. Winter cooking in the Northeast can really start to wear on you–braises and stews, gratins and cream sauces, root vegetables and tough greens. It gets to be a bit much, and we’ve found in the past that as soon as the Brussels sprouts stop showing up at the farmer’s market, we stop really eating vegetables. There is only so much collards, kale, and beets you can take. This winter, in an effort to eat more seasonal vegetables, we’ve been mixing in a little more fruit to mix things up, and this pomegranate, grapefruit, and kale salad is a perfect example. The bulk of the salad is kale but with a little citrus brightness and pomegranate sweetness, the kale feels like something new again and I’m not dying for the start of asparagus season. Place the kale in a large serving bowl. In a small bowl, whisk the olive oil into the citrus juice, and add the salt and pepper into the vinaigrette. Drizzle the dressing onto the kale, and spread the dressing with your fingers. The kale should wilt a bit. Check the salt level and add more if needed. When you’re ready to serve, toss in the grapefruit and pomegranate and, using a peeler, shave Percorino Romano generously on top. Toss gently and serve. OOOOH – brilliant! I have a nice bunch of kale in the fridge and was looking for new inspiration. Perfect timing! Thanks!! 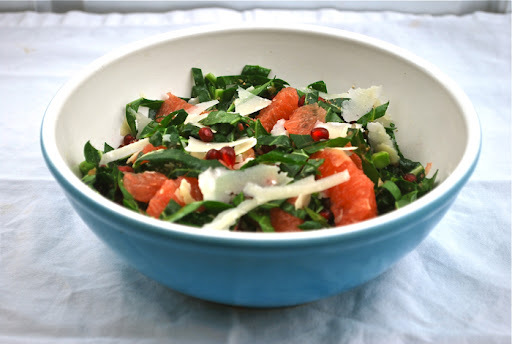 I love raw kale salads and I can imagine that one with grapefruit would be outstanding – and also good for the season. I agree with Julie, perfect timing! This looks lovely! I think I would add a bit of avocado for a little creaminess. This will be a healthy and light January pick-me-up. @Julie and @kickpleat — so glad you like idea! Happy raw kale eating to both of you. @Anna — avocado would be great with this! Grapefruit and avocado are always a divine combination. I’ve read a lot about kale lately…I’ll have to try this…Thanks!